A 2 bedroom apartment in brand new development in Alcaidesa (discounted by up to 27%). This new development in Alcaidesa offers ground floor, first floor and top floor 2 and 3 Bedroom apartments. It is located between San Roque and La Linea de La Concepcion and just a few minutes from Sotogrande. 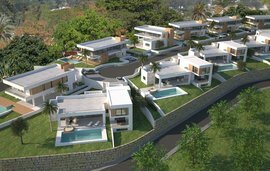 Alcaidesa is the home to several residential developments with luxury houses and apartments and as it is located next to two golf courses is perfect for golfers. Alcaidesa has beautiful, well-kept beaches as well as having good security and a variety of restaurants. 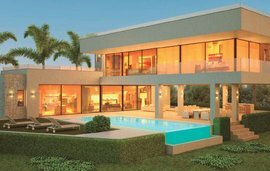 The development offers spacious homes and wonderful views of the Mediterranean Sea, the coast of Africa and Gibraltar. The complex has lovely gardens, with views of the Nature Reserve, the golf course and the sea, a choice of 3 swimming pools with changing rooms and a paddle court. There are 2 and 3 bedroom apartments available on the ground floor, first floor and top floor, all apartment have a fully equipped kitchen, living dining area and two bathrooms. Other features include double glazing, a security door, marble floors, fitted wardrobes, the main bathroom has a hydro-massage bath. It is also possible to acquire the property with furniture. With this apartment a garage space is included in the price.